A recent conversation I had with a reader this week over private message regarding her barefoot horse becoming footsore, revealed a very concerning trend in the horse world today. Livery yards/horse facilities controlling the diet and management of horses not even owned by them. This lady had recently moved to a yard and was starting to have problems with her barefoot horse being footsore, struggling to walk from the field to the yard and was asking for some advice. On further digging, when questioned about what she feeds her horse, she reeled off a list of feeds that were a big red flag, including sweet little extras such as polos. On explaining that the feed was most definitely the issue, her reply saddened me deeply. They feed ALL the horses on the yard the same, and all the horses have to stick to a very strict management regime, which includes many many hours in a stable. When I was trimming in the UK, many of my clients were at such institutions and ended up leaving them to find more liberal accommodation. Their horses improved and they took back control of their horse’s lives. This lady was stuck…there were no yards closer that she could get into, her horse was getting worse….and then what happens? What things start being said? This has to STOP! Yards and facilities have no right to insist on the feeding regime of any horse that they do not own. If they have a strict management regime which is not conducive to the horse’s health please don’t go there! How are owners going to get on top of epidemics such as laminitis, colic, navicular, skin problems, poor hoof health, cribbing, weaving, obesity, behavioural problems….and so much more, when this type of control reeks havoc in the horse world? No-one has the right to tell you how to feed and manage your horse to the point where it starts to have a negative impact on their health and mental well-being. This is EXACTLY why shoeing horses is deemed a necessary act. 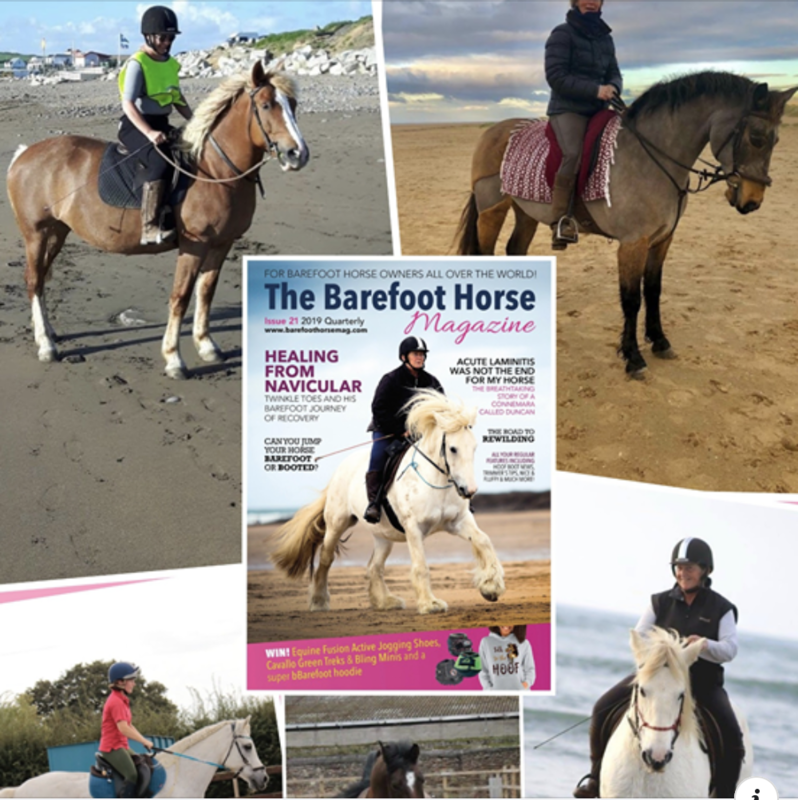 Diet and management is paramount in keeping horses successfully barefoot and we discuss it a lot in this magazine and on this page. Horses all over the world are being shod because their owners believe their horse’s feet are weak, flat footed, had the foot bred off them, need support, need remedial shoes, need special supplements….the misconceptions are numerous. All because the diet is inappropriate. The HUGELY profitable feed companies producing feeds totally inappropriate for the horse, who encourage owners to feed their horse their feeds through clever marketing and scare tactics. Then…on top of this…yards and facilities taking over the needs of your horse…and you keep on paying them to do so! In some cases yards/facilities even tell you what hoofcare provider and vet to use!! If this is your situation and you want to go barefoot or your horse just isn’t doing that well barefoot, then have a VERY BIG rethink. YOU own your horse. YOU should have the final say on what your horse is fed and how it is managed. You are the one who has to pay the bill when your horse’s health begins to deteriorate! Have a thoughtful Sunday…stay in control! Feeding horses the ‘right’ diet is a hotter topic now than it’s ever been. Mainly due to the ENORMOUS profit the big commercial feed companies are making on unsuspecting horse owners. Pushing their feeds as nutritionally suitable for different horses at different stages of their lives. But are these commercial feeds necessary? What were horses fed when these feed companies weren’t around? And WHY is their a bigger epidemic of obesity, laminitis, colic, ulcers etc than there’s ever been? Horses had fewer problems on such grand scales when commercial feeds didn’t exist. Horses were slimmer, fitter and healthier. Ask anyone who was around horses before bagged processed feeds arrived and they’ll tell you they don’t remember a quarter of the problems you hear plaguing horses today. But feeding horses has changed…and many many owners are confused and stabbing in the dark. Often changing feeds frequently and of course spending a great deal of money doing so….and when there’s a problem with their horses’ feet or body, rarely do they think about what they are feeding as being the ultimate culprit! We’ve put together a simple blue print of what the default horses’ diet should be in order to keep them, safe, sound, a good weight and in good health. If you want a rock crunching barefoot horse, then read on. The diet is actually very simple, although many find it harder to implement, and it just takes some trial and error in terms of the logistics of how you manage it. Keeping it simple and consistent is the key. 1. 24/7 365 mixed species hay – yes we do mean all day everyday! Mixed species meadow hay is the optimum – dotted around the field, not just in one place, this encourages the horses to move more, giving them the choice to eat alone or together if they feel like it – always assuming you have horses living together…which is an absolute must for a herd species, even 2 is better than 1. Put the hay in little piles, in tyres or buckets or on the ground, you will find the optimum amount to put out and this will happen over a period of a few days to weeks, until you work out how much they are getting through, the key is that they have a little left by the time you are ready to feed again…but be careful, if it is hay that they have peed on or stuff they just don’t like, it might give you the impression there is a lot left but they aren’t eating it…so stay tuned in and all should be well. Make absolutely sure that there is very little to no rye in your hay….this is crucial…this can make the difference between a footsore barefoot horse and a rock crunching one over time. Google what rye grass looks like if you’re not sure, and if there is too much in there, discuss with your hay man or talk to another supplier. It is worth getting savvy about the hay and then your suppliers can’t pull the wool !! Don’t over feed alfalfa and don’t use it as your main forage. Don’t just use single species hay constantly, Timothy is a good option but shouldn’t be used on its own long term as horses get the main bulk of their important nutrients from their forage, so it needs to be mixed. 3. Salt/mineral block – a Magnesium Oxide base with various minerals is great – they are usually white, big square blocks are the cheapest. Not ones in tubs and absolutely no molasses…which you can usually tell because it’s brown! 4. Bucket feed ONLY if you have an underweight, ‘in need’ senior horse or competition horse who spends MANY hours a day training/competing. If your horse is a good weight or overweight…don’t feed extra! 5. Very little grass…this is the biggest issue for most…which is why so many owners end up creating tracks to limit the grass without any owner stress of stripgrazing etc. If your paddock is fairly bare, that’s great but be careful because your horses are keeping it bare which means they are eating the grass! A good rule of thumb is if you see them on the hay 95% of the time then they aren’t getting too much grass. If you can’t do the above as your base level feeding regime, then there is a risk to hoof/body health….and of course is the reason shoes are still so prevalent. Remember – you aren’t feeding your horse…you are feeding the bacteria in their guts. They are the ones that break down the grass/hay and if you give them too much sugar by constant daily grass grazing instead of hay then that is when troubles begin. Ulcers are the next biggest epidemic hitting our equines right NOW, and one of the most serious, as they largely go unnoticed – this is a worldwide problem. Feed as above and you will mitigate gut stress for the rest of your horses life! A natural as possible diet is the KEY! Once upon a time…really not that long ago, horses worked hard on the land and were the main form of transport, went into war and fought battles…in fact humans heavily relied on them to survive. Horses went lame of course they did, but these animals were a precious commodity and their owners needed to keep them as sound as possible. Many couldn’t just ‘swap’ them for another, if the one they had became unable to work through lameness. Most working horses were shod, farriers were worth their weight in gold. BUT farriers and owners knew that giving a horse a rest from shoes at some point during their working year would help those horses have a longer working life. Today most owners don’t rely on their horses to work and earn them money. Today most horses are ‘used’ for pleasure and their ‘work load’ is no comparison to those horses years ago…but today horses are getting lamer and sicker…why? Well today horses are kept, managed and fed differently. The domestic horse is facing its biggest threat yet…ignorance. In response to this increase in equine lameness and sickness, the number of equine vets is also rising, it’s a very profitable business to get into nowadays. Never before have we had or indeed needed so many equine ‘professionals’ to help our horses get better/last longer. The numbers of farriers aren’t rising fast enough and those that are already ‘in the business’ see lameness and sickness as part of their everyday job. Many of the old timers have gone and with them their knowledge. What is left is a different ethic, one geared around money rather than health. I know because I too saw it on a daily basis. The rise and rise of the ‘barefoot trimmer’ is not because barefoot is the latest fad…it’s because these trimmers are answering a growing demand. This epidemic of lameness and sickness can’t go on. Some are waking up, reading books, finding ‘alternative’ groups to join on media, following their instincts, not listening to their peers at their traditional facility, moving away from the mainstream and finding a better healthier way of looking after their horses…and it works. Most barefoot trimmers train to put themselves out there, facing daily criticism and ridicule, because they too were looking for an answer to help their horse….and when they found it they felt compelled to help other owners and horses find it too. That is progress. You hear the phrases ‘barefoot trimmers aren’t trained, aren’t qualified, lame horses etc’ all over the internet and throughout the traditional equine world…and yet they are still on the rise and their books are bursting. If a barefoot trimmer goes about laming horses, they don’t last long. This is tough work and many can’t cut it. But those that do know what they are doing, and to be honest, despite what you hear, that’s the majority of ones out there who have a big clientele, are encouraging more and more to follow them. When things get really really bad, you can do one of two things…let that bad thing continue, use the same techniques (albeit in different guises)…or change it, find a better alternative. Now more than ever before the equine world is seeing a huge wave of owners voting with their horses bare feet and saying STOP! Stop lameness. Stop sickness. Stop ignorance. Barefoot is NOT just for some horses, it’s for every single horse out there…but many of the owners of those horses are not ready to take the time it takes to find out how going barefoot can help their horse, they’re still stuck hard in their traditional ways, being taught and ‘helped’ by those with a very big vested interest in lameness. If you want your horse to stay healthier, last longer….if you want your bank balance to stop getting slimmer when your horses are getting fatter and/or sicker…then read this magazine. This magazine is one of the pioneers in changing the way people keep their horses, alongside other growing businesses such as hoof boot companies like Cavallo, Scoots, Equine Fusion and more. These businesses and this magazine are answering a growing demand. They are helping horses with lameness and sickness, because when change is needed, some stick their heads above the parapet and start making that change and then more follow…that’s human nature. Barefoot is real, it’s lasting and it’s helping horses all over the world. 10 years ago many owners had never even heard of ‘barefoot’ now if you own a horse, you know! If you want to help your horse then here’s the first step…get this mag into your life and you’ll never ever turn back. Find out how other owners have taken the leap, in many cases gone against all modern advice, and found a way to keep their precious horses sounder and healthier. In our latest issue release that came out on Feb 1st, read about horse owners with horses who were lame and sick and find out how they said STOP, no more, and finally started a journey to help their horses. There is no other magazine like this one on the planet accessible in both digital and print, shipped worldwide to every country and ever corner of the equine world. Our printed back issue 50% off sale has now just ended but you can still get these back issues at a reduced price. If you’re not sure try one or two, read them online or have them shipped to your door, you’ll find information in every one that will make you think….plus the quality is stunning! Our readers LOVE this magazine…just check out the reviews on our Facebook page. Don’t stand by and watch your horse get worse. If what you are doing, or being told to do, isn’t working, then say STOP. Get this mag into your life and join the huge barefoot army of people who are making the biggest change the equine world has ever seen. This is re-writing history!